The US will become a neofeudal nation. Monetary and fiscal policy: it is time for gold again. Trident Juncture – Arctic ice gets hot. The president has said clearly that he does not like what the FED is doing. The FED has to revise its decisions, otherwise Jerome Powell will be dismissed as envisioned by Section 10 of the Federal Act. The FED will have to reconsider its policies so as to enable the stock market to make another push up next year. However, investors should be careful. The emperor has no clothes, and while the S&P is still at an all-time high, it may happen that soon distinguished brands like General Electric, once America’s most valuable company, will be on the brink of bankruptcy. President Trump will not be able to reverse the social decline, the gradual impoverishment of the middle class and the exodus of factories. The tensions within the US establishment are spreading to Europe. On both sides of the Atlantic, there is huge discontent between the native peoples and immigrants, so ethnic clashes are more and more likely. Trust in national governments is eroding and the Western societies will slowly fall apart. While the US remains the world’s sole superpower, it has nonetheless lost the war against the Taliban in Afghanistan. Still, the Washington cabal is clinging to power by imposing more and more sanctions on companies and countries. The Western world and its financial system are breaking down and for that reason gold will again be a safe haven for investors. Energy is pivotal. The conflict with Russia is about energy. As long as Russia is Europe’s main energy supplier, Moscow will wield power over the Old Continent. Operation Trident, NATO’s large military exercises held in Norway, is about energy resources. 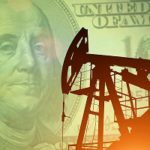 In Gefira 28 we discuss the future of the United States and give the reader an extensive analysis of the US shale oil industry, explaining why the FED will be compelled to change its policies.